RAPID CITY, S.D. (Jan. 2, 2018) – B9Creations, a global provider of professional 3D printing solutions, announced today the release of a new resin designed to meet the needs of the high-speed, high-precision prototyping and manufacturing environments. Gray resin sets a new precedent in speed and resolution, reaching 120+ mm per hour without sacrificing surface quality. With the ability to produce models in a matter of minutes, users can verify and change functional designs faster than ever before. With the strength properties of ABS plastic, this material delivers dimensional accuracy, high temperature resistance and strength – ideal for snap-fit, engineering assemblies and durable prototypes. 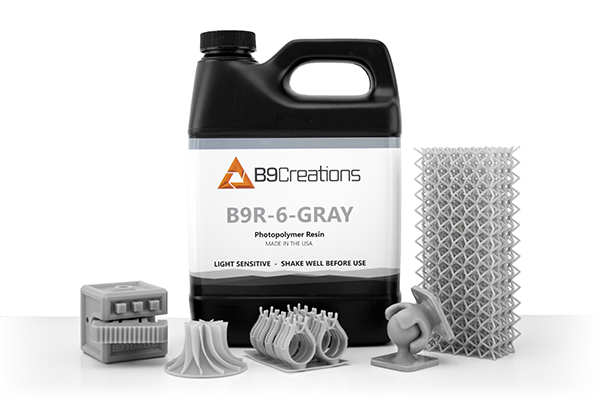 “An industrial-grade material at a fraction of the cost, B9Creations’ Gray resin is engineered for extreme build speeds, high precision and unbeatable resolution, whether in the prototyping phase or leveraging the speed of our Core Series printers for finished part production.” said Shon Anderson, CEO. Paired with the B9 Core Series 3D printer, Gray resin brings finished part production with ABS-like properties in a digital factory affordable for businesses of almost any size. Learn more about B9Creations cost- and time-efficient material for prototyping and production here or request a free sample.